Auschwitz concentration camp. Lookout tower. Photo: SOMMER, Karen Margrethe/ICRC. 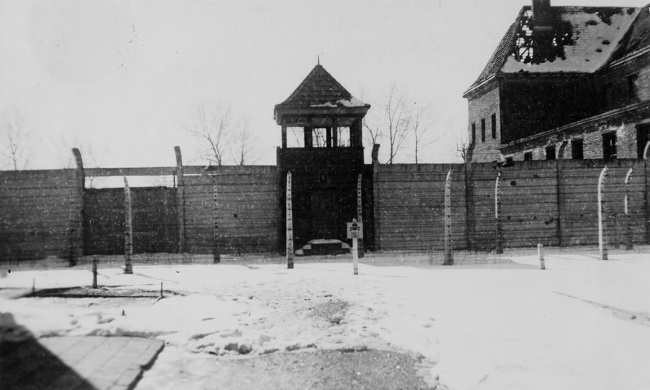 The fiftieth anniversary of the liberation of Auschwitz concentration camp was held on 26-27 January 1995. In addition to many survivors and distinguished guests, the ICRC attended in its capacity as Nobel Peace Prize laureate. Attending the ceremonies at Krakow and Auschwitz were several hundred survivors of the camp, representatives of associations of former deportees, 19 heads of State and numerous distinguished guests, including Mr Elie Wiesel and Mrs Simone Veil. Invited in its capacity as Nobel Peace Prize laureate, the ICRC was represented at these ceremonies by its President, Mr Cornelio Sommaruga; Mrs Liselotte Kraus-Gurny, a member of the Committee; Mr Charles Biedermann, Director of the International Tracing Service; Mr François Bugnion, Deputy Director for Principles, Law and Relations with the Movement, and Ms Ewa Tuszynski, interpreter.